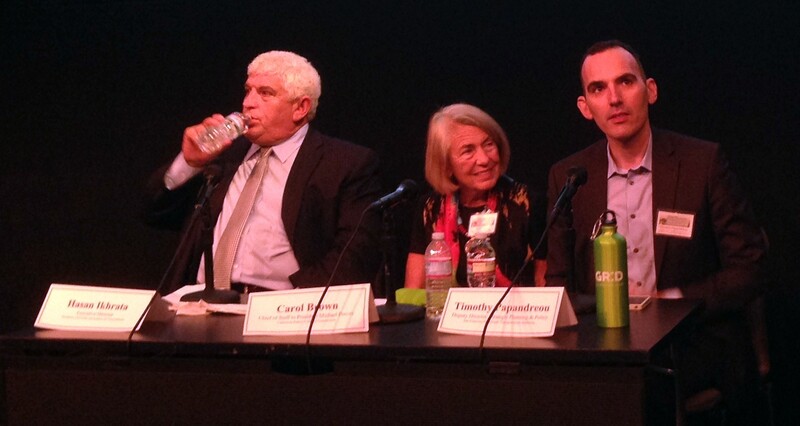 The Digital Cities, Smarter Transportation conference was held yesterday in Little Tokyo. SFpark San Francisco’s Innovative Parking Pilot: San Francisco Municipal Transportation Agency’s (SFMTA) Alex Demisch presented on the technology and technological challenges behind SFpark. San Francisco is one of the first places on earth to actually attempt to manage the price of curbside parking toward Shoup’s 85 percent recommendation, and certainly the first to do this using real-time technology. For the basics on SFpark, maybe start with this video, then follow with plenty of SBSF coverage and the SFpark website. Demisch explained the challenges – from managing huge amounts of data, to fully inventorying street parking (counting ~280,000 spaces and ~30,000 meters, plus all the street rules regarding which side parking is allowed at what hours of which day), to dealing with cutting edge electromagnetic parking sensors embedded in the streets. SFPark’s on-the-street pilot phase has ended (limited in part by the battery-life of in-street sensors) and is in the process of analyzing data, with reports forthcoming. Making Los Angeles A Context-Aware City: Mayor Garcetti’s new Chief Information Technology Officer Peter Marx explained “context awareness” and hinted at how the city is looking to move toward this. What is “context awareness?” Basically your phone knows who you are, what you’re doing (and what you did before), where you are – so, when everything is set up, your phone can do things like ordering your coffee for you just before you arrive at your coffee shop. What the implications are for L.A. City services isn’t entirely clear yet. Stay tuned for new initiatives to be announced. Driverless Cars: Steven Shladover, a Research Engineer for California Partners for Advanced Transportation Technology, reviewed driverless car technology. It’s been just a decade away since 1939. Shladover’s bottom line prediction: driverless technology’s holy grail of “full automation” is still “many decades away” (and the standard is a disappointing “no less safe than today’s driving.”) See also Juan Matute’s SBLA article Vehicle Automation versus Connectivity, and What it Might Mean for Traffic last week. Cars with Drivers, Summoned by Your Phone: “Transportation Network Companies” (including Lyft, Uber, SideCar) are growing, using technological models that make them much more nimble than the highly-regulated taxis they arguably compete with. It’s encouraging to hear Emily Castor, Lyft’s Director of Community Relations, state that their “big vision” goals include “taking cars off the road.” See also Juan Matute’s SBLA article The Growth and Growing Pains of Transportation Network Companies last week. The most hopeful image for technology’s role in a bright future for urban transportation was voiced by SFMTA’s Timothy Papandreou during the conference wrap-up panel. Though there are serious potential issues with privacy, public agencies can benefit tremendously from the torrents of real-time travel behavior data that is becoming available as smart phones become ubiquitous. Historically (which is to say basically right now and for the last few decades), transportation and planning agencies depended on data based on phone surveys. Accessing more robust data in real time can lead to better data-driven decision-making, making transportation safer, faster and more convenient for everyone.